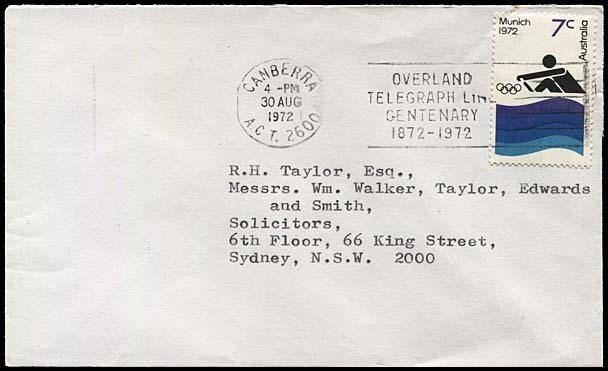 Slogan cancellations: Overland Telegraph Line Centenary: 1872 - 1972.
was officially introduced at all G.P.O.s on 21 August 1972 for a period of two weeks. 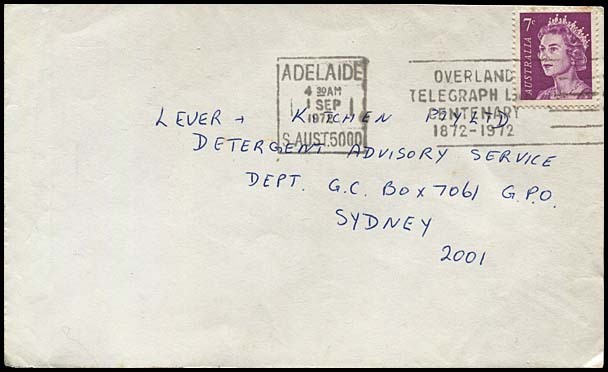 The slogan was also issued to Post Offices in Alice Springs, Canberra, Darwin - all three with circular date stamps - and at Newcastle and Launceston. Use of the slogan is also noted elsewhere at Hindley Street, Mount Gambier, Port Augusta and Port Lincoln although none have been sighted for inclusion in this Census. 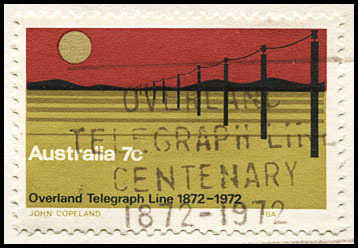 The Overland Telegraph commemorative stamp (shown to the right) was issued on 22 August. 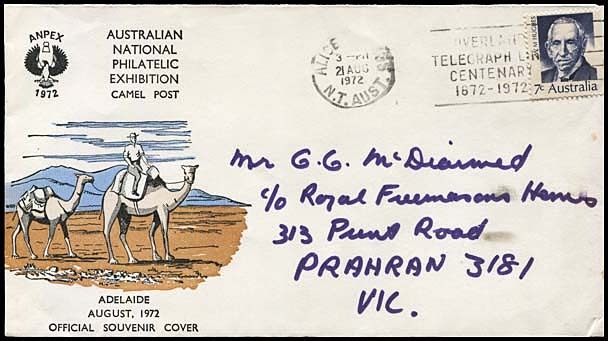 A wider coverage was apparently given to the use of the slogan in the Northern Territory (Darwin and Alice Springs) and in South Australia (Port Augusta). Use at these offices is reported to have commenced in early June and continued intermittently until September. 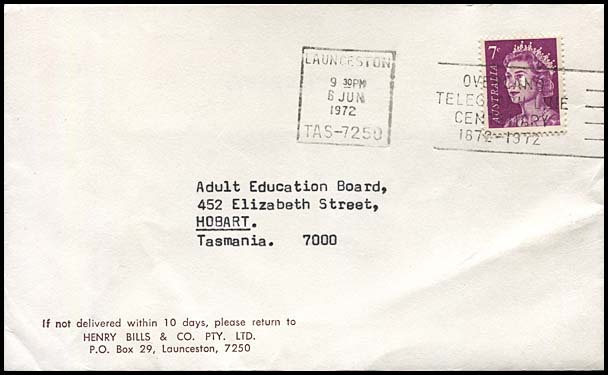 If that assertion can be verified, then it also appears that Launceston was part of this early release program - see below. 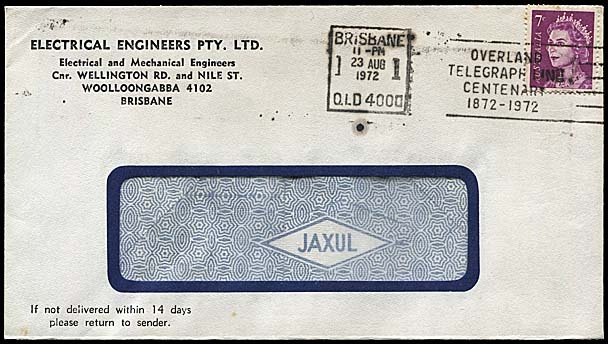 Earliest recorded date for this slogan: 5 June 1972 at Launceston. Latest recorded dates for this slogan: 29 September 1972 at Launceston. There are no variations between or within Offices in the size or space of letters. 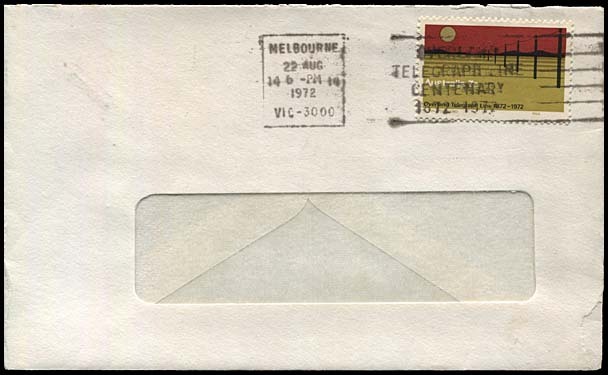 The only variations are related to the details and arrangement within the date stamp. There are 102 examples of this slogan in the Census. Box number: 1 (no serifs top or at the base). Number in the Census: 2. Number of dies recorded: 1. 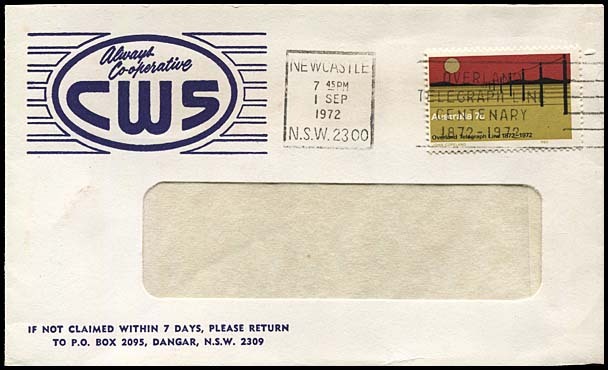 21 August 1972 - First Day for use of this slogan. Number of dies recorded: 2. Number in the Census: 43. 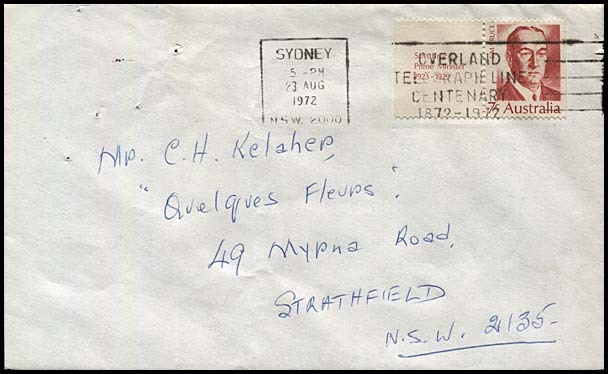 8 August 1972 - about 2 weeks before the national release but well after the introduction in May. Number in the Census: 40. 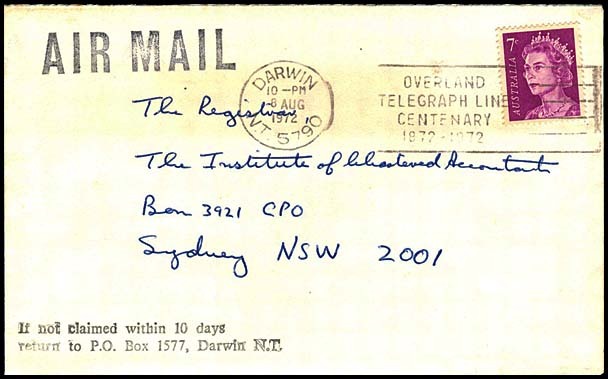 6 June 1972 - very early date and probably part of the program for selected offices. Number of dies recorded: 3. 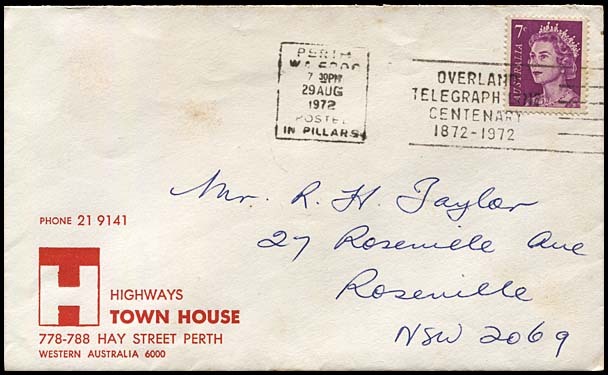 List of all Post Offices using Telegram/Telegraph slogans.